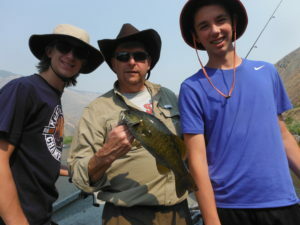 At Wild River Adventures, you’ll do your Idaho fishing in an open drift boat with an experienced guide who knows which holes on the Salmon River hold the fish you’re after. Whether you’re an experienced angler or a brand new fisherman, we’ve got you covered; we provide all the rods, gear, tackle and bait. Note: Shorter day trips are available to fit your schedule. 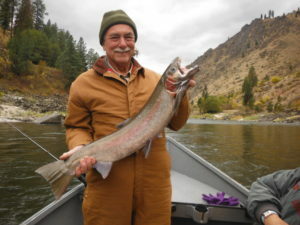 We’ll be fishing the Salmon River from Vinegar Creek to Island Bar for steelhead that range from 23 to 40 inches long and weigh an average of 6 to 20 pounds. 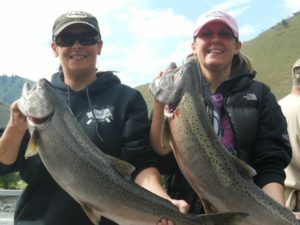 We’ll fish the Salmon River from Riggins to Hammer Creek, near White Bird for Chinook Salmon that range from 18 to 40 inches long and can weigh up to 40 pounds. Fishing from Vinegar Creek to the Lower Gorge, we’ll hook you up with a fresh catch of the finest bass or trout that call the waters of the Salmon River home.